Our popular Jack the Joker Fundraiser will continue this Sunday night in Minnies Bar where the Jackpot will be €8,800 as on Sunday night Paul Hallahan was drawn out of the drum and picked card 44 which wasn’t the Joker though he did win €50. Anne Sweeney and Lee O’Donnell won €25 each. As well as our group of ticket sellers tickets can be purchased from Convince Store Ballinroad, Village Flowers, Spar, Mike Kiely’s Butchers, Mousies Takeaway, Minnies Bar and Crottys Corner Bar. On Friday night last we played the Western Semi Final in Fraher Field where we took on St. Carthage’s. The team gave a fantastic display and with 57 minutes played we led the game and looked set for a memorable victory. Unfortunately our opponents struck for a late goal to give them the win. Whilst we are naturally disappointed to lose the game the players and management team can be proud of their display on the night. TEAM: L. POWER, J. DUGGAN, B. LOOBY, S. O’CONNOR, E. BERGIN, E. COLLINS, C. KINDREGAN, J. ELSTED, C. PRUNTY, O. YOUNG, D. COLLINS, R. CONWAY, S. CLIFFE, S. DALY, M. MAHER. SUBS: E. KIELY, B. HENLEY. This Sunday our Club Bingo continues in the CBS Hall at 8:30 pm where the jackpot is €1,700. Our Monster Bingo will take place in The Park Hotel on Sunday 9th November at 3pm with €3,000 in prize money. As always your support would be greatly appreciated here. 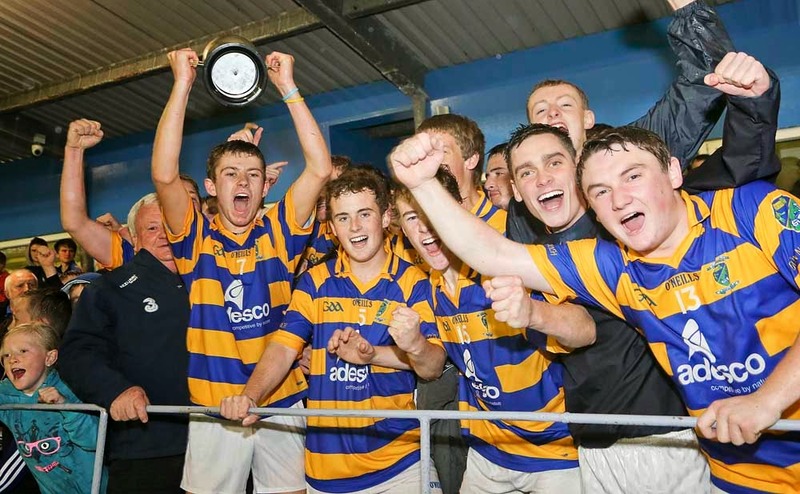 The Juvenile AGM takes place on Thursday night the 27th November at the GAA club grounds. There will be no outdoor hurling this Saturday morning. The indoor season starts on November the 14th at the Friary College. Teamers will be sent out to all for this in plenty of time. Our under 16 football team travelled to Ardmore on Sunday last. After a great display by all we came out well on top to qualify for the Western semi final. Our popular Jack the Joker Fundraiser will continue this Sunday night in Minnies Bar where the Jackpot will be €8,650 as on Sunday night Chloe Veale was drawn out of the drum and picked card 44 which wasn’t the Joker though she did win €50. Rosie Cosgrave and the Seanu Kiely won €25 each. As well as our group of ticket sellers tickets can be purchased from Convenience Store Ballinroad, Village Flowers, Spar, Mike Kiely’s Butchers, Mousies Takeaway, Minnies Bar and Crottys Corner Bar. This Friday night we play the Western Semi Final in Fraher Field at 7:30pm where we take on St. Carthage’s. This Sunday our Club Bingo continues in the CBS Hall at 8:30pm where the jackpot is €1,650. The club is running a children’s disco on Saturday, 26th October in Creation nightclub between 4pm and 6pm. This event is very kindly sponsored by Frank Nugent’s Centra in Abbeyside. This will be a fancy dress Halloween themed event and all the kids of the parish and beyond are invited to attend. Hopefully there will be a big turn out on the day. L to R: Billy Ryan, Mark Ferncombe, Jason O'Brien, Richie Foley, Tiernan Murray (Capt. ), John Kindregan, Darrell Ryan. 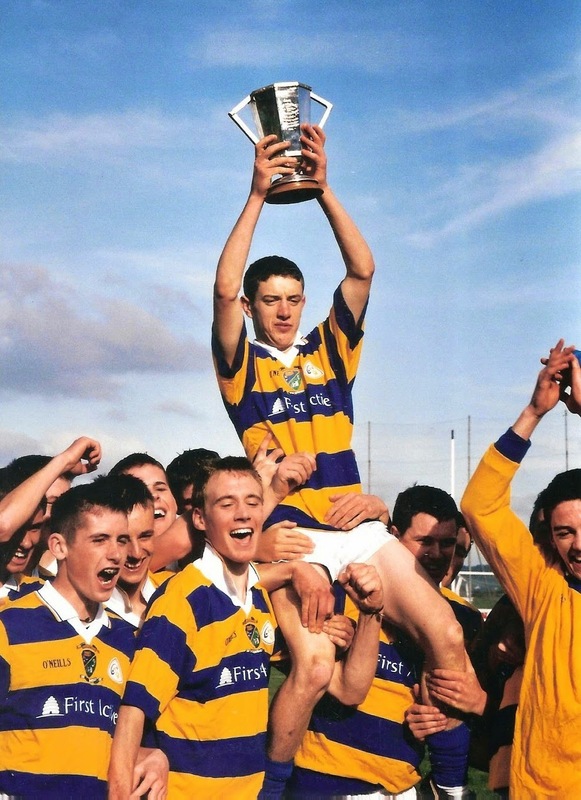 This week's photo brings us back 10 years to the County Minor 'A' Hurling Final of 2004 and shows Abbeyside captain, Tiernan Murray being lifted shoulder high by his team mates following victory over Mount Sion at Fraher Field. This win secured a second successive title at the minor grade, having beaten De La Salle twelve months previously. Our popular Jack the Joker Fundraiser will continue this Sunday night in Minnies Bar where the Jackpot will be €8,510 as on Sunday night Conor Clancy was drawn out of the drum and picked card 32 which wasn’t the Joker though he did win €50. Mike Kiely and the Whelan Family won €25 each. As well as our group of ticket sellers tickets can be purchased from Convenience Store Ballinroad, Village Flowers, Spar, Mike Kiely’s Butchers, Mousies Takeaway, Minnies Bar and Crotty’s Corner Bar. On Saturday night last we were defeated by Stradbally in the County Semi Final in Fraher Field. We would like to thank all the players and management team for the commitment they gave to the team for the last two years. TEAM: S. ENRIGHT, D. COLLINS, B. LOOBY, C. MOLONEY, S. O’DONOVAN, S. BRIGGS, R. FOLEY, S. O’HARE, J. O’MAHONY, P. HURNEY, M. FERNCOMBE, M. FIVES, J. O’BRIEN, G. HURNEY, M. O’HALLORAN. SUBS: G. BREEN, M. GORMAN, C. PRUNTY, J. HURNEY. On behalf of all in the club we would like to congratulate Modeligo and Cappoquin on their victories in the County Junior and Intermediate Hurling finals respectively. We wish them the very best of luck in the Munster Club Championship in the weeks ahead. This Sunday our Club Bingo continues in the CBS Hall at 8:30 pm where the jackpot is €1,600. A wonderful morning was had by all last Saturday morning for our annual Danny Lenihan Cup Day. Over 120 underage hurlers were present from under 5 age group right up to under 10 where 6 cups were competed for. The skill shown by these youngsters on the day was very high and just shows you that the training every Saturday morning that their after receiving over the summer has paid dividends. A big thank you to all the coaches and parents involved without whom this day would not have been the success it was. Also to Niamh Enright for organising the event and making sure the event went off without a hitch. Finally to our ladies committee a big thank you must go for keeping everyone refreshed on the day with tea, coffee, biscuits, crisps etc. A wonderful job was done by all. 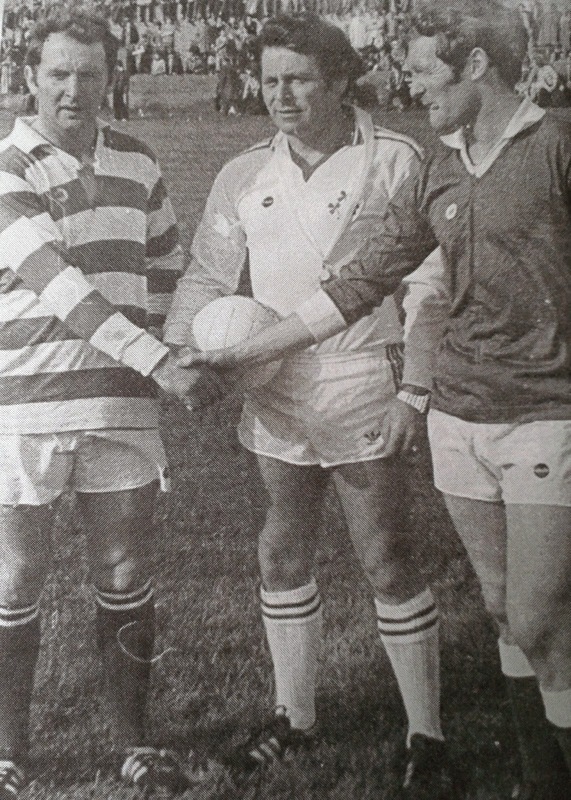 This week's photo comes from the 1979 County Senior Football Championship Final played at Fraher Field between Ballinacourty and Ferrybank and shows the pre-match handshake between captains Joe Power and Stephen Breen under the gaze of referee Jim Joe Landers. After a titanic battle, Ballinacourty secured the title on a scoreline of 1-12 to 1-11. Our popular Jack the Joker Fundraiser will continue this Sunday night in Minnies Bar where the Jackpot will be €8,316 as on Sunday night Richie Walsh was drawn out of the drum and picked card 11 which wasn’t the Joker though he did win €50. Helen Foley and the Breen Family won €25 each. As well as our group of ticket sellers tickets can be purchased from Convenience Store Ballinroad, Village Flowers, Spar, Mike Kiely’s Butchers, Mousies Takeaway, Minnies Bar and Crottys Corner Bar. Adult Club members stood shoulder to shoulder at their training session on Wednesday night last, wearing the orange jerseys of the Cycle Against Suicide Movement. The core message of the cycle against suicide is that it is OK not to feel OK, and it is absolutely OK to ask for help, and there is good help available locally, we just have to ask. The momentum for the cycle spinoff event on Saturday 18th October is beginning to build, and our club community has helped to engage more people who are joining a conversation we all desperately need to have. It's ok not feel ok, but it is not ok to ignore the fact that we all experience a range of emotions and it is absolutely not ok to fail to acknowledge the vital role that mental health plays in our overall well-being. This community, our community, have helped start and lead this conversation. Together shoulder to shoulder we can take mental health issues from the silence and shadows in which they thrive into the light and vitality of open discourse. For more information, check out the Cycle Against Suicide Dungarvan Spin Off page on Facebook. On Friday night last we defeated St. Saviours in the County Quarter Final in Fraher Field and we now advance to the Semi Final against Stradbally. This game will go ahead on Saturday night at 7pm in Fraher Field. SUBS: G. BREEN, M. GORMAN, J. RYAN, R. SHEEHAN. On Sunday night last in truly atrocious weather conditions our Intermediate football team took on Brickey Rangers in the Western Final. At the end of a hard fought first half the sides were level with both teams trying their best to overcome the near impossible playing conditions. The second half was equally as hard fought but at the full time whistle it was Brickey Rangers who were ahead and we wish them the best of luck in the County Final. This team can be most proud of their performance not alone on Sunday night, but in all their games in the championship and we thank their management team of Eddie O’Halloran, Tom Whelan and Geoff Collins for all the work they did with the team. TEAM: R. RYAN, M. LAVAN, D. HENLEY, M. POWER, E. BERGIN, P. LYNCH, E. ENRIGHT, L. HURNEY, C. PRUNTY, D. FERNCOMBE, R. DUNFORD, D. LOOBY, T. MURRAY, E. COLLINS, D. POWER. SUBS: M. MAHER, C. KINDREGAN, J. MOORE, S. O’CONNOR, J. ELSTEAD. This Sunday our Club Bingo returns to the CBS Hall at 8:30 pm where the jackpot is €1,550. On Sunday last, Bernard Shields, on behalf of the club, made a special presentation to Fr. Michael Enright who this year celebrates his Golden Jubilee in the priesthood. Fr. Enright is a Club President and a great supporter of all our teams. We wish him many more happy years in his ministry. Our under 12s had a busy week where we were in action on Monday against Kilrossanty in the football league. We played some very good football here and won the game. On Wednesday we travelled to Tramore and played our last game in the autumn hurling league. Well done to everyone here for making the journey and effort over the last 3 weeks. On Friday evening we played Dungarvan at home in the football league and what an exciting game it was where it was nip and tuck the whole way through the game and eventually ended a draw. Training continues every Wednesday evening and every player needs to make every effort to attend, we have two games left to play in the town and county football league. Well done to our minor hurling team lead by Jack Duggan who won the County Minor Hurling B title in Fraher Field Dungarvan on Friday night last against a very gallant Glenshelane outfit. We dominated this game throughout up until the last five minutes where our opponents scored three goals to cut the margin to a goal. In what was a very nervy finished indeed we held out to claim the championship. Praise must go to every single player on the panel who gave great commitment all year and to Pa, Donnacha, Mickey and Tiernan for their input throughout the year. Everyone in the club would also like to send out a good luck message to Ronan Mansfield who broke his leg just before the semi final and he turned out to be a big loss indeed. Get well soon Ronan. Last but not least we must thank all those at the Park Hotel for the lovely meal they provided after the game. Well done to all. Click here to see pictures of our Western Intermediate Football Championship Final against Brickey Rangers in atrocious weather conditions at Fraher Field on Sunday night last. Once again, thanks to Seán Byrne Photography for the photos. Click here to see pictures of our County Senior Football Championship Quarter Final victory over St. Saviour's which was played on Friday night last in Fraher Field. As always, many thanks to Seán Byrne Photography for the photos. 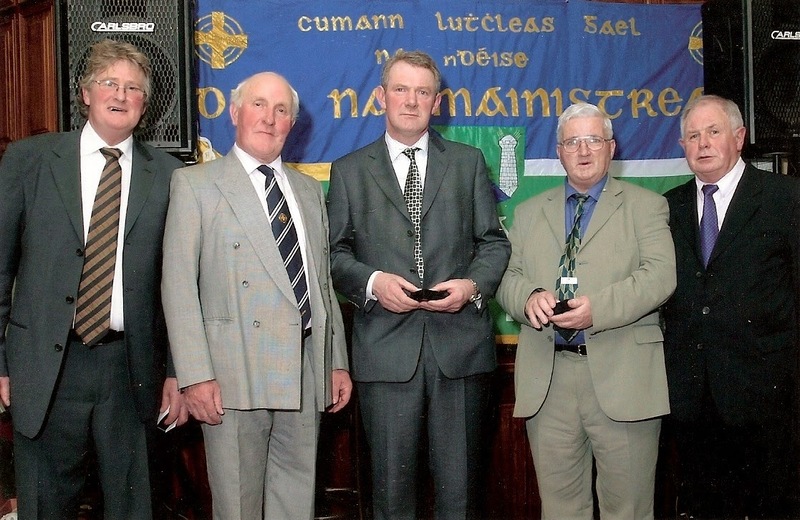 L to R: Greg Fives, Noel Fleming, Pakie Hurney, Bernard Shields & Tony Mansfield. 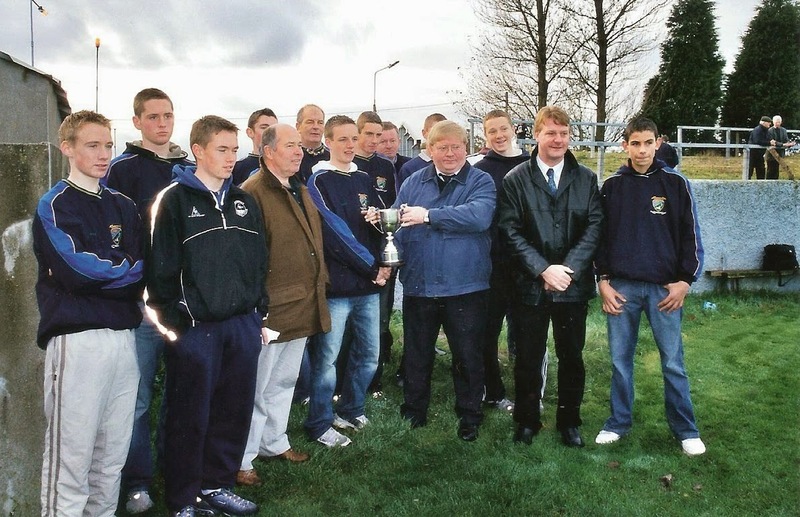 This week's photo comes from the club social held at the Clonea Strand Hotel in early 2004 and shows the U21 Football selectors who masterminded victories in both the Western and County Finals the previous year. These wins began a remarkable run of success at this grade. The divisional and county titles were also won in 2005, 2006, 2007 and 2008. A few weeks ago, two U9 panels competed in the annual Roanmore Blitz. Click here to see pictures of the presentations. Congratulations to our Minor Hurling panel and management team on their fantastic victory in tonight's County Minor Hurling Division 2 Championship Final against Glenshelane at Fraher Field. In atrocious weather conditions, the lads, with great skill and battling qualities, claimed a 1-16 to 4-4 win. Thanks to Seán Byrne Photography for supplying us with these photographs. Our under 14 team had a fantastic 8-9 to 1-6 victory over Roanmore in the County Hurling Final played at Fraher Field, last Saturday afternoon, and in doing so retained their title from last year. A tremendous second half performance was given as both teams were level at the halftime break 2-2 to 1-5. The Abbeyside boys really picked up their game after the break and played some very good hurling. The standard of blocking, tackling, passing and finishing was a joy to watch. There were some excellent individual performances, however it was the teamwork that really set them apart from the opposition. We outscored the city side by 6-7 to a single point in the second half. A delighted Meldan O’Dwyer received the cup on behalf of the panel and in his acceptance speech thanked the management, players and parents for their work and help all year. Later the players went for a celebratory meal and afterwards toured the parish by car with the cup. This has capped a tremendous year for this panel of players winning both the Feile Hurling and Football County Finals earlier this year and Saturday adding the hurling county championship to the football one captured in the spring. This is a rare achievement for any team and the first time achieved in the club. Our minor hurling team played against Clann na Gael on Wednesday night of last week and played well in the second half to come out on top in the county semi final at the Fraher Field. They now play Cappoquin in the County Final this Friday night coming again in the Fraher Field at 6.30 before the senior footballers take on St. Saviours. We would encourage all supporters to come along early and cheer on the team and we as a club would like to wish all the players and mentors well. Just a reminder to parents that the Danny Lenihan Cup for juveniles will take place on Saturday morning, 11th October at the Burgery.